‘Tinnitus’ is defined as the perception of sound in the absence of corresponding external acoustic stimuli. A difference exists between subjective and objective tinnitus. Subjective (somatic) tinnitus is a phantom phenomenon and is heard only by the patient. Objective tinnitus can be described as a condition in which noises are generated within the body and transmitted to the ear, e.g., via spasms of the tensor muscle of the tympanic membrane .It is audible to another person, as a sound stemming from the ear canal. Severe tinnitus is associated with depression, anxiety and insomnia. 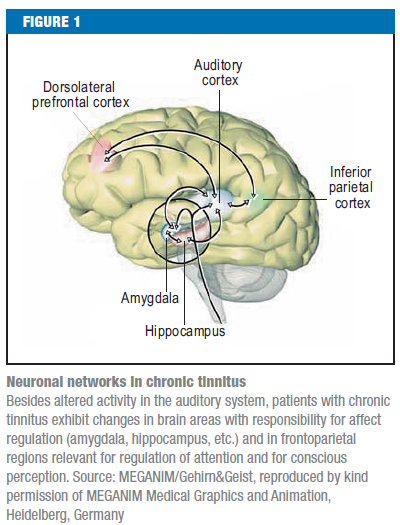 A neural connection between the somatosensory and the auditory systems may be important in tinnitus. Anatomical and physiological evidence support this statement. The trigeminal and dorsal root ganglia transfer afferent somatosensory information from the periphery to secondary sensory neurons in the brainstem. These structures send excitatory projections to the cochlear nucleus. 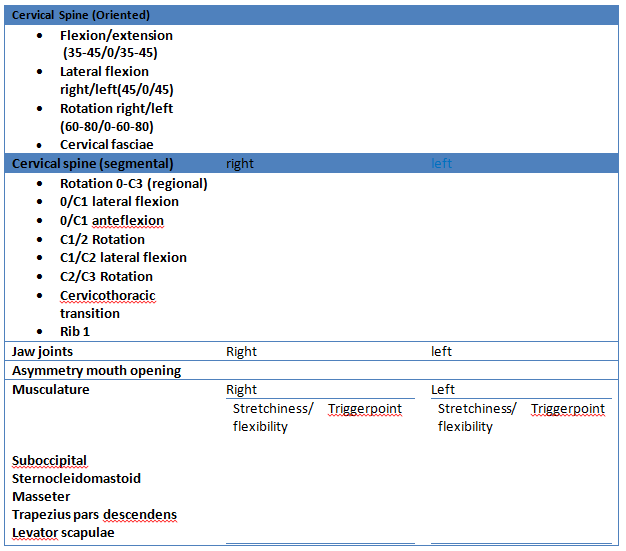 Moreover, the cochlear nucleus innervates parts of the trigeminal, ophthalmic and mandibular nuclei. Signals from the trigeminal supply the hearing system in the cochlear nucleus, superior olivary nucleus, and inferior colliculus. Patients with chronic tinnitus exhibit changes in brain areas with responsibility for affect regulation (amygdala, hippocampus, etc.) and in frontoparietal regions relevant for regulation of attention and for conscious perception. Tinnitus is multifaceted with a variety of causes: otological, neurological, metabolic, pharmacological, vascular, musculoskeletal and psychological. Despite the fact that tinnitus is often seen in connection with hearing impairment, not all patients have impaired hearing. Subjective tinnitus is a phantom phenomenon. An example of a phantom phenomenon is acoustic hallucination which is particularly in patients with schizophrenia or after consumption of hallucinogenic substances. In Latifpour DH et al, 2009 the relationship between the somatosensory system, disorders/dysfunction of head and neck and tinnitus is described. Aggravation of tinnitus can be caused by disorders of the somatosensory system of the upper cervical region and head. Dysfunction of the head and upper-neck region can cause tinnitus via activation of the somatosensory system. Strong muscle contractions of the head and neck can modulate the tinnitus perception of 80% of tinnitus patients and elicit a sound perception in 50% of people without tinnitus. These somatic phenomena are equally spread among people with or without a disorder of the cochlea. A clear connection can also be seen between jaw disorders, neck pain, headache, and tinnitus. There could also be a connection between nerve impulses from the back of the neck and head through multisynaptic connections in the brainstem and cochlea. Patients with tinnitus hear noises in absence of a corresponding external acoustic stimulus. Tinnitus consists of unorganized acoustic impressions of various kinds. The ear noise may be perceived as unilateral, bilateral or arising in the head. In case of objective tinnitus, the sound can be heard by another person. In case of subjective tinnitus, patients can have acoustic hallucinations and tend to involve the perception of sounds in organized form, such as music or speech. A distinguish can also be made between pulsatile and non-pulsatile tinnitus. Pulsatile tinnitus is synchronized with the heartbeat and can be a symptom of vascular malformations. Tinnitus can also appear as an extensive fluctuating tinnitus. In this case the ear noise can be modulated by movements of the jaw or cervical spine. In case where the ear noise can be modulated by movements of the jaw or cervical spine physiotherapy or examination by an orthopedist/orthodontist should be considered. Magnetic resonance imaging to exclude a vestibular schwannoma is recommended in patients with unilateral tinnitus and a distinct right-left discrepancy in hearing acuity. Pulsatile tinnitus is synchronized with the heartbeat and can be a symptom of vascular malformations. These patients should be referred to a doctor for neuroradiological examination. 1) The mobility of neck flexion and extension, lateral flexion right and left, rotation right and left by using an inclinometer. The measurement is performed in a sitting position and the best value of three is noted. 2) Posture by using a kyphometer. The measurement is performed in a standing position. The thoracic kyphosis is measured from C7-T12 and the lumbar lordosis from T12-L5. No medicinal approach can yet be regarded as an established treatment option. Accordingly, neither in Europe nor in the USA has any drug yet been approved for the treatment of tinnitus. The indication for pharmacotherapy is therefore restricted to the treatment of comorbidities such as anxiety disorders, sleep disorders, and depression. Gritsenko et al., 2014 describes in a case report of a 65 year old man in which is diagnosed a facet arthropathy of C2-C3, a successful treatment by applying a medical branch block of C2-C3 in combination with radiofrequency ablation of C2-C3 medial branches. Up until now 5 methods has been found to be effective as a treatment for tinnitus. Stretching, posture training and auricular acupuncture also decreases significantly tinnitus up to 3 months after the treatment. It is recommended to stretch the tense muscles of the neck and shoulders, like m. sternocleidomastoideus, m. trapezius, m. levator scapulae, m. suboccipitalis … This method is based on somatosensory stimulation and it may be useful as an alternative treatment. Finally, Qigong has been proven to be an effective way of treating tinnitus. No side-effects have been shown, there is a significant improvement in somatic tinnitus severity and the effects remain stable for at least 3 months after the last session. Cognitive behavioral therapy (CBT) is the best-evaluated treatment for chronic tinnitus. The general aim of CBT in patients with tinnitus is to improve awareness and facilitate the modification of maladaptive patterns on the cognitive, emotional, and behavioral level.